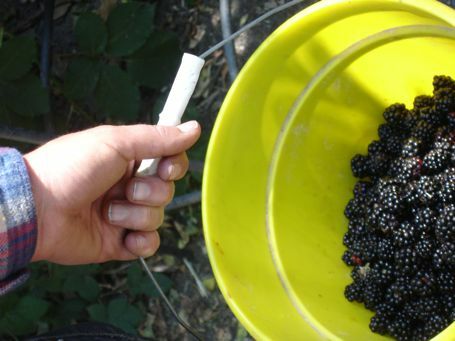 There are two summer themes this year—gathering free fruit to make jam, and seeing how little sugar we can get away with using and still call it jam. Ok, sometimes its sauce. But I’m ok with that. 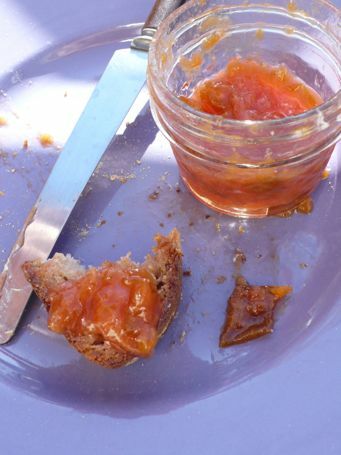 I’ve been obsessed with making low sugar jam ever since I served as a judge in the Good Food Awards last year. Turns out that spending the day tasting dozens of jams can leave a person with a terrible stomachache that lasts a couple days. After the first five jams, they all tasted the same…sweeeeet. So this year my goal is to preserve the flavor of the fruit, not the sugar. The first bout of jamming took place on 4 of July weekend. We’d been visiting friends who live in a development alongside a trail that leads to the nearby delta and Port of Sacramento. Before the trail was built, backyards had extended out farther, so the area the trail runs through is lined with feral fruit trees of all sorts. 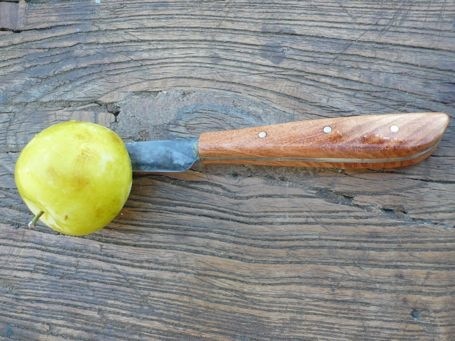 Plum season! 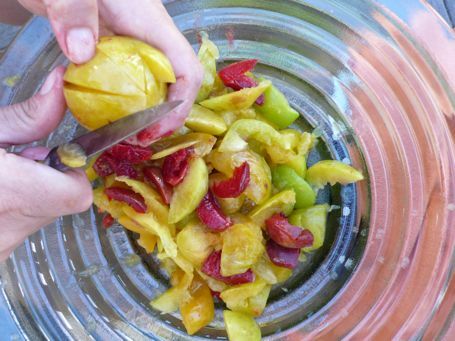 Yellow plums, green plums, red plums. 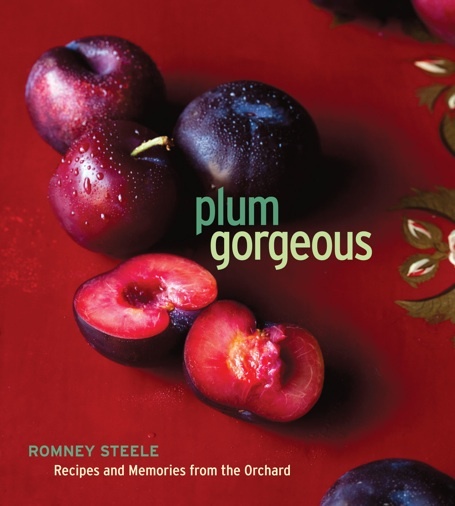 All kinds of plums were ripe and plopping off the trees all around us. Five of us filled bags and bags of them and, since nobody else wanted them, we took them home to make jam. 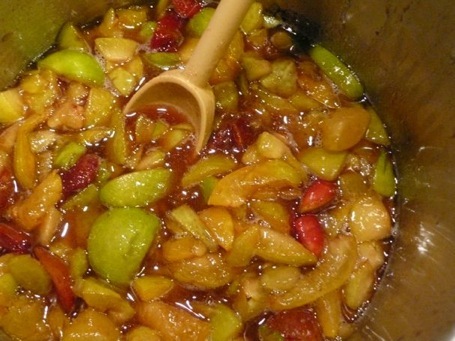 Mixed plum jam. 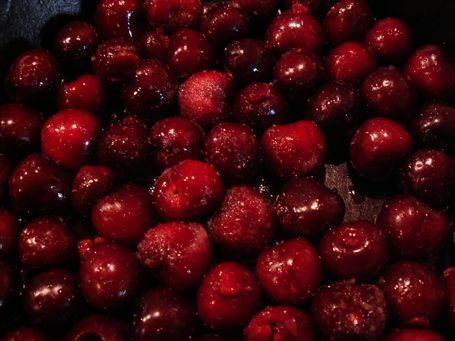 We used about 1 1/2 cups sugar for every four cups of cut fruit. 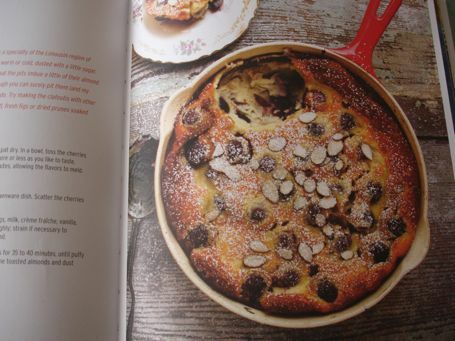 Considering most recipes call for equal parts sugar and fruit, that’s low. The jam was tart. Almost too tart. Since low sugar jam is more perishable, we processed it for 15 minutes in the jars. Bout two of jamming crossed state lines. We timed our camping trip up north to coincide with Oregon blackberry season. After camping in the woods for two days, and picking blackberries for two hours, we were ready for a little indoor time. 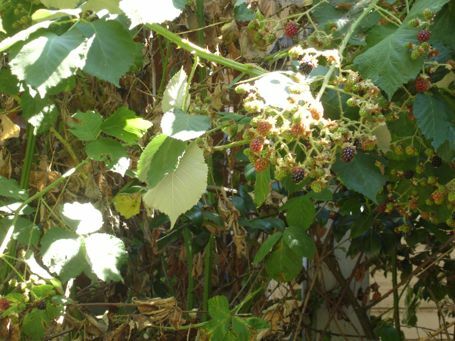 A rented apartment in Ashland, a few showers and nice dinners out, a Shakespeare play, and an afternoon reading and making blackberry jam…and before we knew it we were headed home with not quite enough jars of Oregon summer. This time, we upped the sugar ratio to account for the blackberries being somewhat under ripe. 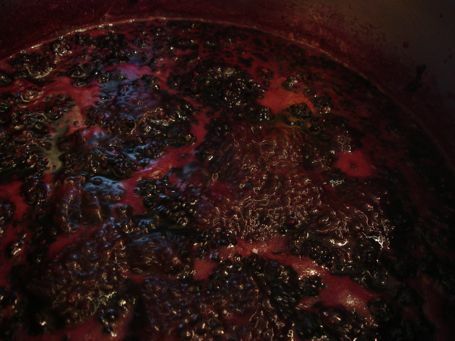 We used two cups sugar for every four cups of blackberries. And it’s almost too sweet. What’s next? Figs? Show me the tree! Chilly Bay Area summers make waiting for that first green tomato to ripen like waiting for Congress to negotiate a budget. Thankfully green tomatoes have a lot more going for them than our typical legislators. They’re way more fun; they have a movie AND a book named after them; they’re tasty; and, instead of making you want to cry, they give you a great excuse to fry. If that’s not enough, you can eat them with the godfather of all milky goodness, burrata! So get on it. Go out there and pick those suckers and make some fried green tomatoes. 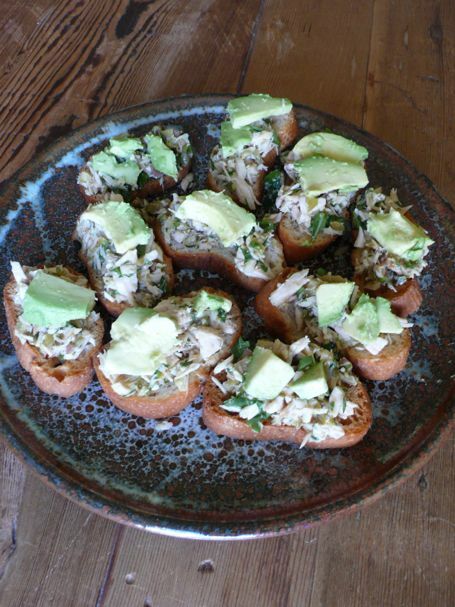 I served these as part of a special birthday meal that included tuna, olive, and avocado canapés, (pictured below), seared sea scallops with spicy brown butter over grits, and sautéed green beans with shallots and toasted walnuts, and for dessert: panna cotta with Ellen’s canned, honeyed cherries. I accidentally bought cream instead of buttermilk so we decided to make butter (and buttermilk) a la minute in a jar, just like in elementary school. 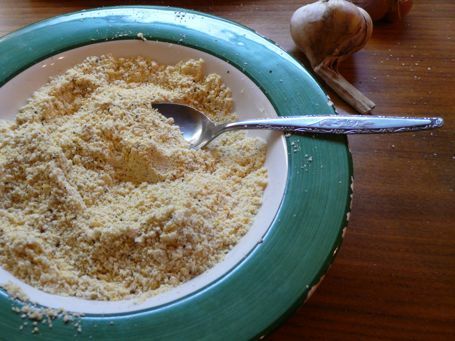 This fancy stone ground cornmeal from a small mill in the south definitely made for a superior crunchy texture and super corny flavor, but regular cornmeal is just fine. Put the buttermilk and cornmeal in separate shallow bowls. Season the cornmeal generously with salt and pepper. Heat a heavy, cast iron skillet over medium high heat. Add the oil so it comes about 1/2 inch up the sides of the skillet. 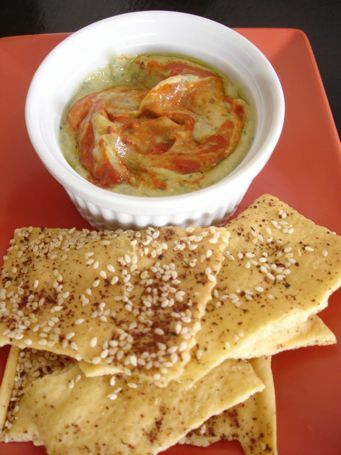 While waiting for pan and oil to heat, dunk the tomato slices first in the buttermilk and then in the seasoned cornmeal. Test the pan for heat by dropping in a sprinkle of cornmeal. 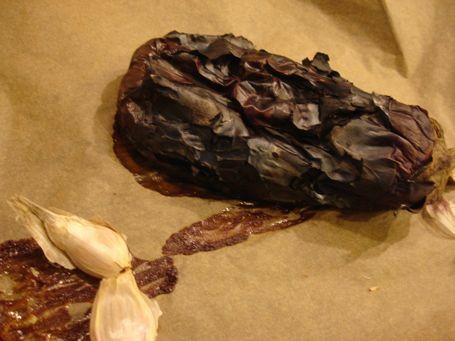 It should sizzle in a lively fashion, but not burn. The surface of the oil should look shimmery but shouldn’t smoke. 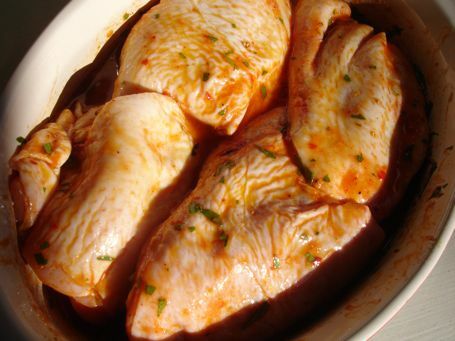 When the pan is ready, put in the tomato slices two or three at a time, depending on their size and the size of your pan. You don’t want to crowd them or they won’t fry properly. Fry the tomato slices until golden brown, then flip carefully and fry the other side. Meanwhile, ready your plates. Slice the burrata, Lay out a little arugula (if using) and drizzle it with good olive oil. Top this with the tomatoes, topping each tomato with a slice of burrata and a sprinkle of basil. 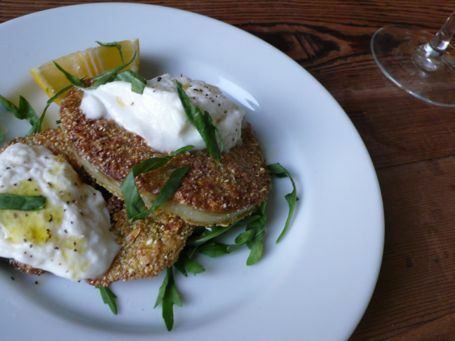 Season the burrata with salt and freshly ground pepper and drizzle the top with good olive oil. Serve immediately. Here’s a method for making a quick seafood stew that’s both sustainable and perfect for casual summer dining. No need to turn the oven on or fuss for hours in the kitchen. Sustainable seafood is a complex topic. Even if you conscientiously refer to the guidelines of the Monterey Bay Aquarium Seafood Watch program, you’ll likely still encounter grey areas and gaps in information. 1. Species are often misnamed at fish counters; for example: rockfish is commonly referred to as red snapper, which is endangered. And while some Northern California rockfish are plentiful, others are not. 2. Sustainability often depends on where and how a fish was caught (information that isn’t usually available). 3. Farmed seafood can be farmed poorly or environmentally responsibly. Without visiting the operation, you’ll never know. 4. Not all types of seafood make it on to those little wallet cards, so you’ll often find yourself left in the dark. 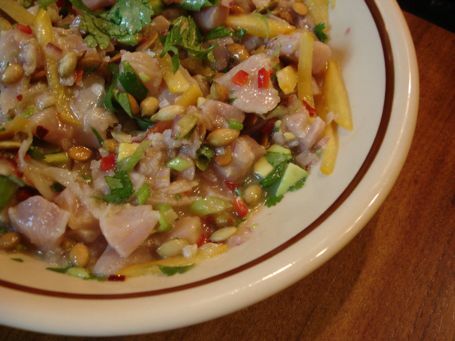 Thankfully, there are a few fairly sure bets in the world of sustainable seafood. And they happen to make great seafood stew! Our local squid comes from a sustainable fishery and is also quick to reproduce and low in toxins. Make sure you buy California squid and clean it yourself. If you buy cleaned squid, it’s entirely possible that it was caught here, shipped to China, processed, and shipped back. Not so great from a carbon footprint point of view. Plus the fresh (never frozen stuff) just tastes better. Read this post for instructions on how to clean them. DIY Delicious includes one recipe for sustainable seafood stew, but I like to use the basic technique and vary my stew according to my mood, the season, or what’s in the market. 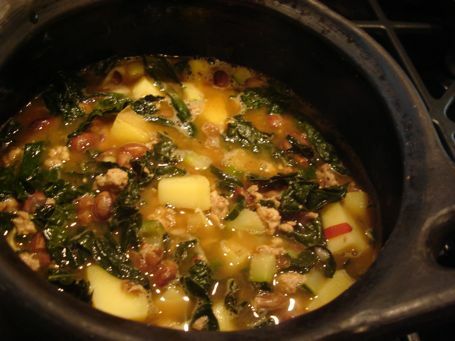 We made the stew pictured above in a cooking class I taught at River Myst Haven in Healdsburg, CA. It was a hit! You can make this stew as basic or as luxurious as you like. 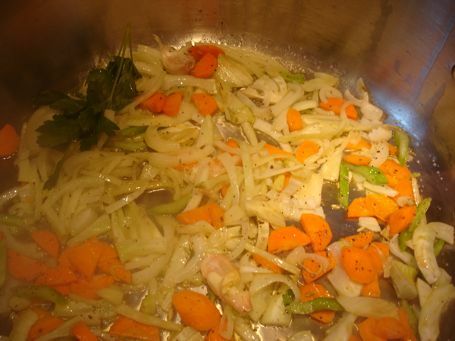 The basic broth is easy, quick, and invaluable in the kitchen. You can vary the alcohol, adding anything from wine, to beer, to Pernod. For a Southeastern US flair, add Old Bay Seasoning. 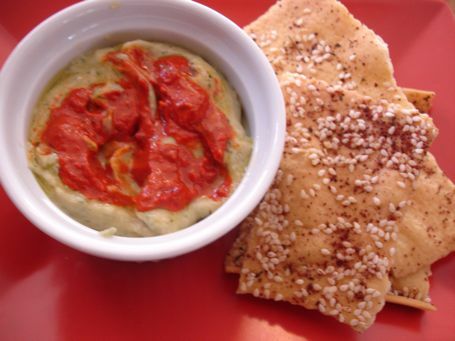 For a classic Mediterranean flavor, add saffron. 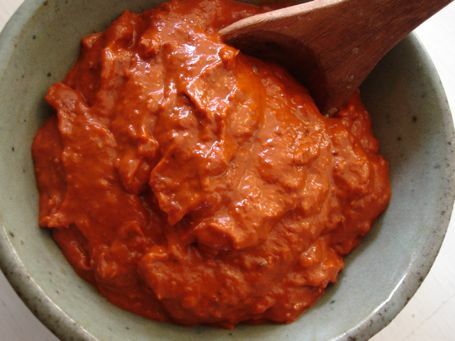 If tomatoes are in season, add them. If not, leave them out. You can vary the aromatics and herbs however you like. 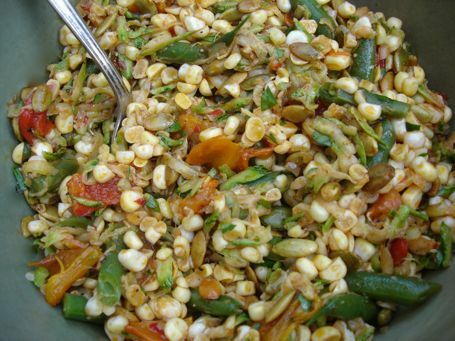 You can even add chiles, lemongrass, and coconut milk and go in an entirely different direction. Experiment away. For serving this version, I like to float baguette croutons spread with a homemade lemony, garlic aioli in each individual bowl. In a medium soup pot over medium heat, warm the 1/4 cup oil. Add the onion, (or leeks) celery, carrot, fennel, garlic, chiles (if using), tomatoes (if using), saffron (if using), and a few pinches of salt. 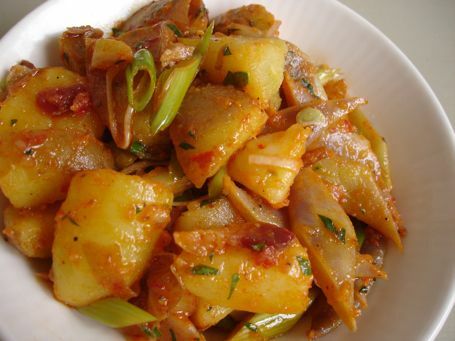 Let the vegetables cook gently until soft and aromatic, about 10 minutes. 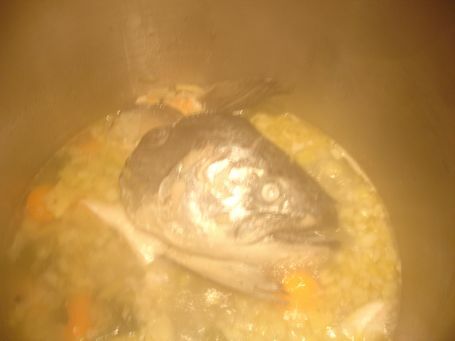 Add the fish heads and bones, 5 cups water, the wine, (or other alcohol), parsley, (or other herbs) peppercorns, and fennel (or coriander) seeds and bring to a boil. (this is when you would add lemongrass, if you were using it) Skim any scum from the top and lower the heat to a simmer. Simmer until fragrant and the broth begins to color, about 20 minutes. Remove the broth from the heat and strain it. Return the broth to the pot, taste, and adjust the salt, pepper, and acid by adding a little more white wine (this is when you would add the coconut milk if you were using it) if desired. 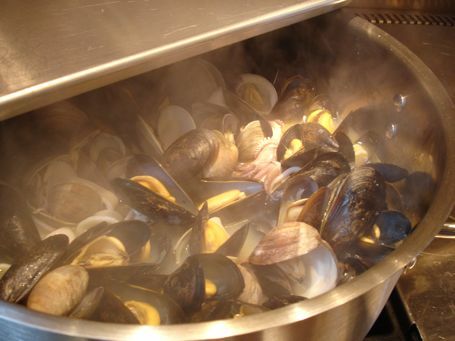 Add the clams and mussels, cover, and simmer until they just open, 3 minutes or so. Add the squid and turn off the heat. Let sit, covered, for 30 seconds. 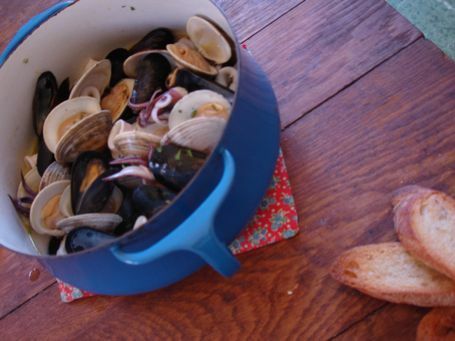 Discard any unopened clams or mussels and ladle the stew into 4 warmed, shallow bowls. I enjoy a kitchen challenge. My favorite variety of challenge is when I don’t have the necessary equipment for what I want to accomplish and I have to make do with what’s on hand. I think problem solving in the kitchen makes us smarter cooks. Recently a special someone and I had a hankering for biscuits, but the oven was broken. The situation was made all the more urgent because there was a big ‘ole jar of hand-made, slow-cooked sorghum syrup that had traveled all the way from Sneedville TN to San Francisco, CA and I badly needed to convey some of it into my mouth on a hot, crispy biscuit. It was suggested by a smarter cook than I that we try the stovetop. We figured if we could make biscuits on a home stovetop in a cast-iron pan then biscuits in the campsite would be in our future. All the more reason to make a go of it. But first: the sorghum syrup. If you’ve never tried it, it’s kind of like molasses, only more edible. It’s overall milder, and shares some of the characteristics of molasses. It has a similar flavor—pungent, minerally, and sweet, but less bitter and with a (for lack of a better word) bright aftertaste that’s missing from molasses. It’s gorgeous, reddish brown and thick. It’s made the same way as molasses, but from sorghum instead of sugar cane. If you’re interested in the process, here’s a video by Whole Foods Market about a small producer called Muddy Pond Sorghum Mill. Oh, yeah, there was no rolling pin or biscuit cutter either. But a Straus milk bottle and champagne glass worked just fine. 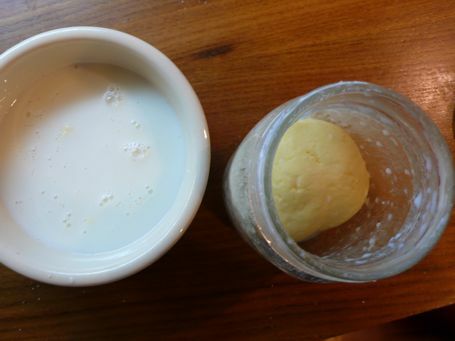 Bonus points if you’ve recently made the Cultured Butter (page 121) from DIY Delicious and you have some buttermilk to use for your biscuits. So much better! 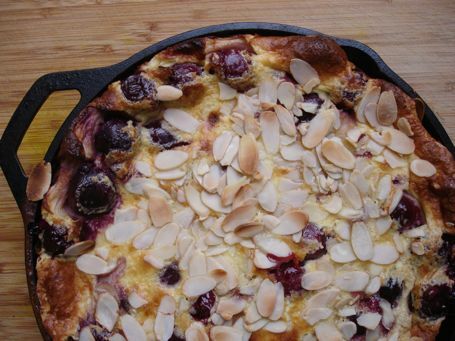 Preheat a dry cast iron skillet over medium high heat. In a large bowl, combine the flour, salt, baking powder, and baking soda. Whisk together. Add the butter and cut it into the flour with a pastry blender or your hands (if you can work fast), distributing it evenly and stopping when the chunks of butter are the size of peas. 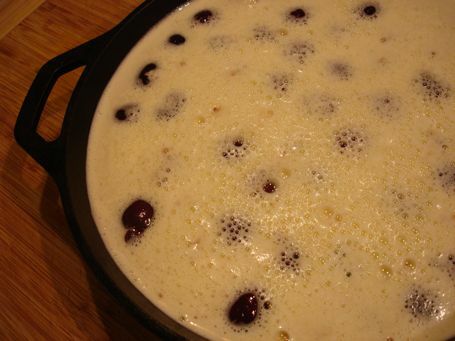 Pour in the buttermilk and mix with a spoon, just barely. You want to stop messing with the dough well before you think you should because this is the secret to flakiness. The dough will still be crumbly and wet and not at all a neat mass. Get over it and dump it on a clean, floured surface. Working quickly, push and pat it together with your hands. It will still be awfully messy. That’s ok. 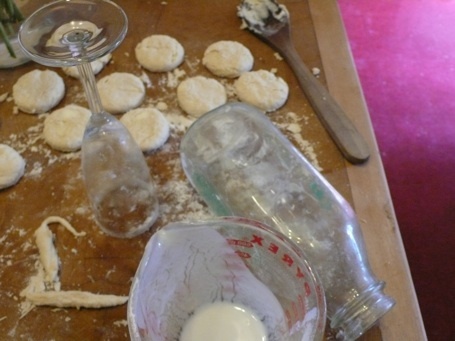 Messy dough=better biscuits. Roll it to a one-inch thickness. Cut into small circles. Put a tiny knob of butter in the skillet and swish it around. Put in the biscuits. Feeling free to crowd them. Slap a lid on ‘em. (it doesn’t have to fit tight). Cook them until you can see they are cooked halfway up the sides. Flip them and cover them back up. Take the lid off after a few minutes to let them crisp up. 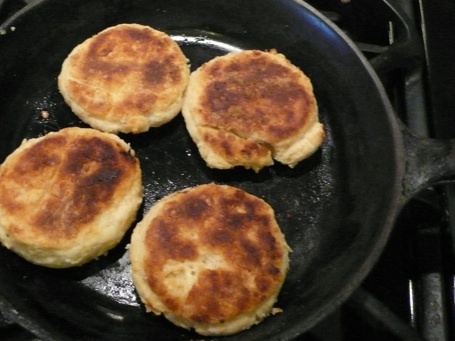 Remove biscuits from skillet, and turn that mother off before it explodes, and then eat. 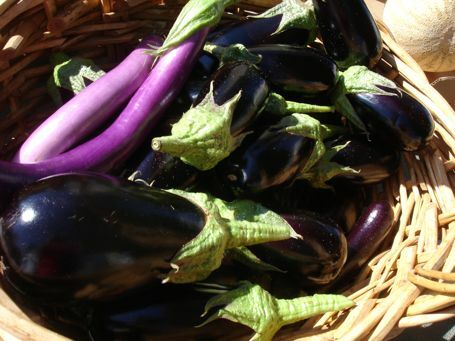 If you’re looking for something fun to do in a beautiful setting on Memorial Day weekend, you should consider joining me for a hands-on DIY cooking class at River Myst Haven. It’s a gorgeous place that’s nestled among the hills west of Healdsburg on Westside Road. From scratch, we’ll create building blocks of the DIY kitchen and then use them in a seasonal menu that we’ll all enjoy together. Participants will learn how to make mustard, which we’ll use to create a glaze for pork canapés and also the vinaigrette for a seasonal salad. 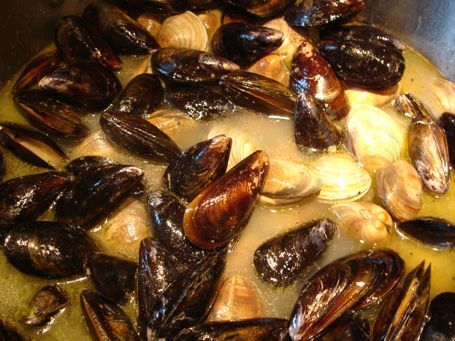 We’ll enjoy homemade Meyer lemon parsley aioli on a sustainable seafood stew. We’ll learn how to make yogurt and talk about all the different ways to use it, as we create a yogurt cake with seasonal fruit. Finally, we’ll have a cultured butter making demo and tasting. $100. Sign up here.